Joseph Baldwin born in Newark, New Jersey to parents Joseph and Joanne Baldwin, beloved father of Monique Mercado and brother of 3; Anthony Baldwin, Terry Lamont Baldwin and Tracey Lamont Baldwin. 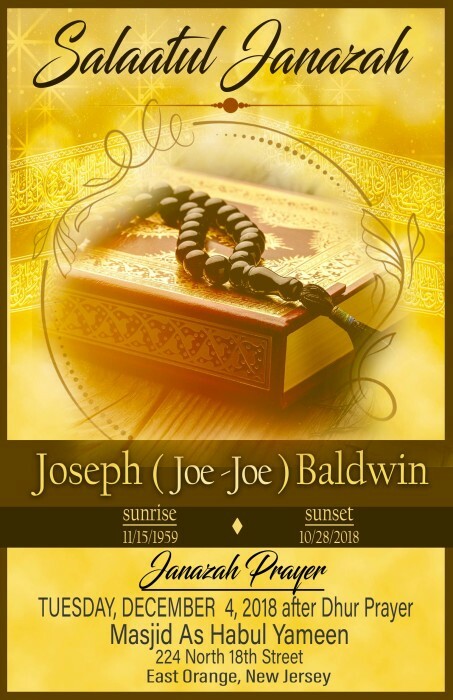 Joseph also was uncle to several nieces and nephews; Muslimah Hasin, Malikah Merritt, Imani Baldwin and Great Uncle to Adrie Torn Jr. Joseph was raised in East Orange New Jersey where he attended East Orange High School and he was known by his friends and family as ‘Joe Joe’. Joseph entered this world on November 15th 1959 departed October 28th 2018, he was loved much and will be missed even more.